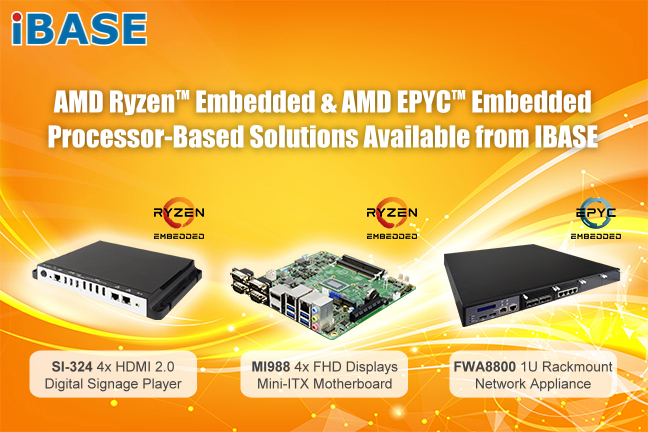 Taipei, Taiwan, February 22, 2018 - IBASE Technology Inc. (TPEx: 8050), a world leader in the manufacture of industrial motherboard and embedded systems, today launched a series of new AMD Ryzen™ Embedded and EPYC™ Embedded processor-based products, including the MI988 Mini-ITX motherboard, SI-324 4x HDMI 2.0 digital signage player and FWA8800 1U rackmount network appliance. The MI988 Mini-ITX board and the SI-324 signage player come with the Ryzen Embedded V1000 to empower businesses with a stunning new level of true 4K@60p video performance, multi-display support and flexible power consumption to support rich multimedia capabilities. They also feature a configurable thermal design power (cTDP) option that supports a programmable TDP range from 12W to 54W, giving system designers the flexibility to tune power consumption and thermal profiles to meet their unique requirements. Additionally, the SI-324 signage player comes with 4x HDMI 2.0 (4K@60p) with independent audio and IBASE sole iSMART auto-scheduling & Observer hardware monitoring technologies. Developed for network security, firewall and UTM, the FWA8800 network appliance is leveraging the EPYC Embedded 3000 to enable a new generation of networking solutions that bring the efficiencies of EPYC datacenter technology to mainstream server networking systems. The system is designed with a variety of IBN modules, supporting 25G/10G/1G fiber or copper ports, and is offered with a long product life-cycle of up to 10 years. AMD, the AMD logo, EPYC, Ryzen, and combinations thereof, are trademarks of Advanced Micro Devices, Inc.